Voriconazole is a broad spectrum agent used to treat serious fungal infections. Stability studies conducted so far refer to the stability of the injectable formulation in different solvents, packaging materials and on storage but studies on the inherent chemical stability of the drug are not available. The purpose of this study was to evaluate the stability of the drug under stress conditions, in solution and in the solid state; isolate and elucidate the structure of the major degradation product and evaluate the antifungal activity of the degradation products. The quantification of the drug after exposure to degradation conditions was studied by a validated LC method. Among the conditions tested, it was found that the drug is more rapidly degraded in an alkaline medium, exposure to UVC radiation (254 nm) and elevated temperatures (60 °C). Degradation was greater under the first two conditions and in solution. Tablets exposed to UVC radiation for 14 days remained chemically and physically stable. For the isolation of the major degradation product, semi-preparative LC was employed and for the structural elucidation, spectroscopic techniques (1H and 13C NMR spectroscopy, IR spectroscopy and mass spectrometry) were used, and the major degradation product identified as 1-(2,4-difluorophenyl)-2-(1H-1,2,4-triazol-1-yl)-1-ethanone. The degraded samples were evaluated through microbiological assay and found to have no antifungal activity. 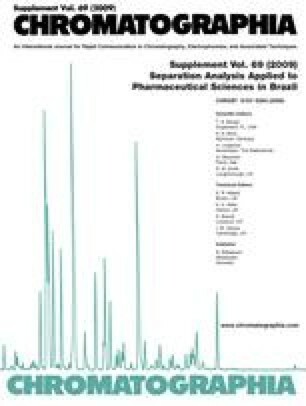 Separation Analysis Applied to Pharmaceutical Sciences in Brazil. The authors wish to thank the Laboratórios Cristália (Brazil) for the supply of the reference substance. Authors are also thankful to Laboratório de Produção de Padrões Secundários (LAPPS), Laboratório de Ensino e Pesquisa em Controle de Qualidade (LEPCQ) and Centro Bioanalítico de Medicamentos/UFRGS (CBIM).